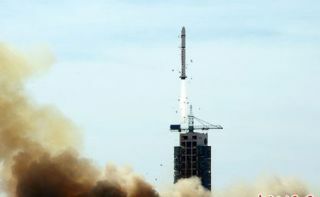 A Chinese Long March 2D rocket carrying the new satellite Shijian ("Practice" in Chinese) blasted off on June 15 at 9:39 p.m. from the Jiuquan space center. Chinasuccessfully shot a scientific research satellite into orbit on a Long Marchrocket Monday, marking the country's fourth space launch of the year. The satellitelifted off on a Long March 2D rocket at 0139 GMT Tuesday (9:39 p.m. Monday)from the Jiuquan space center near the border of northern China's InnerMongolia and Gansu provinces, according to the state-run Xinhua news agency. Launch occurred at9:39 a.m. in China. The 13-storyrocket, powered by two hydrazine-fueled stages, delivered the Shijian 12 to anorbit over Earth's poles. Trackingdata showed the satellite was in an orbit with a low point of 357 miles, a highpoint of 371 miles and an inclination of 97.7 degrees. Xinhuareported the spacecraft will be conducting a variety of experiments, inlcuding"space environment probe, measurement and communications." Thesatellite was developed by the Shanghai Academy of Spaceflight Technology,according to Xinhua. Chinahas previously launched Shijian satellites to test new technologies, carry outspace experiments, measure the radiation environment in orbit and conduct otherscientific research. Monday'slaunch was the 12th flight of the Long March 2D rocket since 1992 and the 27th space launch toreach orbit worldwide this year.